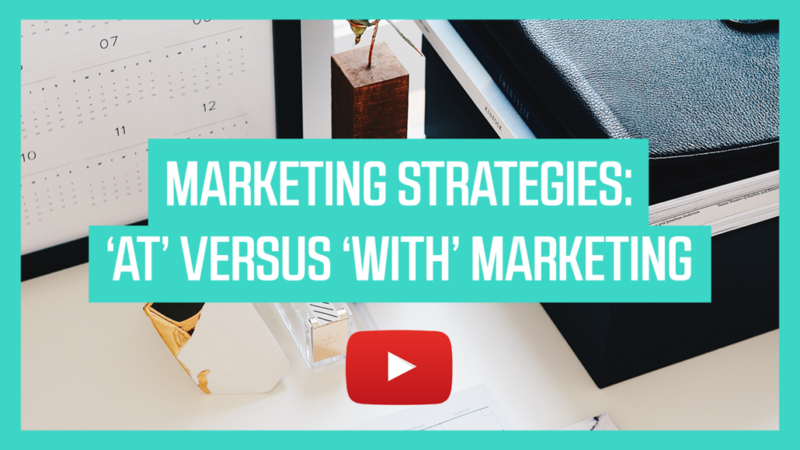 This is part 1 of the marketing series for private practices and we’re going to look at Marketing Strategies: ‘At’ versus ‘With’ Marketing. ‘At’ marketing is where a marketing company, a business or some sort of entity is pushing their marketing at people whether or not they want it. This is what traditional marketing is like – if we think about it it’s intrusive and it doesn’t feel good. I don’t need to know about that new soda pop because I don’t drink soda pop. ‘With’ marketing is completely different, that’s joining your client exactly where they’re at. You’re joining them, you’re with them, you’re on their side. You’re producing content and you’re producing products that are actually helping them live a better quality of life. If we think about some of our favorite products (we’re buying things every single day), it’s because in some way they improve our lives and that’s what you want your private practice to do. You want it to be marketed in a way that’s authentic to you, that it improves people’s lives and that helps them to have a better quality of life. 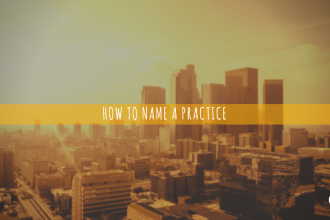 So in this whole series it’s not about convincing people, it’s not about tricking them, it’s about authentically letting them know about what your practice is doing and how you can help them. The core of everything is being able to identify the pain your particular client is dealing with. What we want to do is be able to understand them, to think through things. Know who your ideal client is so that you can let them know what the outcome is – here’s what they want, here’s what they need and here’s what they desire. In marketing there are 7 different keys that are standard in the marketing world. Product: You want your product to be good. You’re doing counseling, massage therapy or chiropractic, so you want to know what your core product is. Often times people will have all sorts of different products and instead of focus on what’s the best product they focus on all these ancillary things. So at the very beginning of marketing you want to look at your product and evaluate its quality. Price: You do not just want to compete with price but you also want to compete in other areas. Knowing your price and knowing what’s standard in your market is key for you to be able to market yourself well. If you’re always going to market yourself at the low end, there will always be someone that will go lower than you. You have to know what your price is for your ideal client. Promotion: This is what we typically think about when we think about marketing. It’s getting your name out there and having a budget that’s actually going to improve the amount of clients that know about you. Place: This is the physical place where you have your office. How does it look and feel? What does it communicate about your business and what you value? What do you hang on the wall, how clean is it and what’s the overall flow of your place? Think about the location in town, what does that communicate and how is that marketing as well? People: People are essential, not just you as a counselor, massage therapist, chiropractor or whatever your private practice is, but we also want to look at all the people that your potential client touches. So who’s answering your phones, what does the voicemail sound like? What does the music sound like? Look at that whole environment and what the people communicate throughout your practice. Process: From start to finish, what kind of touch points do they have when they’re on your website? What’s the process to schedule their first appointment? After they start counseling with you or doing the services that you offer, what is the process there? You want to take them through a very clear process so that it’s organized and they feel taken care of. Physical evidence: What is the physical evidence of your business? What is the outcome of counseling, what happens when someone joins you in your process? What would those testimonials look like even if you don’t ask for testimonials? These seven P’s are at the core of marketing and understanding the basics of business. Types of marketing in private practice – for you to understand what options you have, to make the best decision for your business. Website optimization – how you can optimize your website, how you can grow it and use it as a hub for getting people into your practice. Building organic traffic – you want people to come to your website without you having to pay for them. This is of course unless you decide that you want to. Content marketing – advanced teachings around building content that’s going to help you market your business. Paid marketing – what types of paid advertising to use. Quarterly marketing plan – creating your marketing plan for each quarter step by step. Joe Sanok is an ambitious results expert. He is a private practice business consultant and counselor that helps small businesses and counselors in private practice to increase revenue and have more fun! 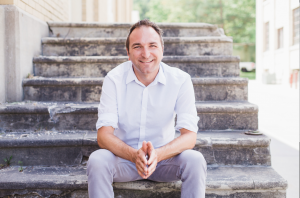 He helps owners with website design, vision, growth, and using their time to create income through being a private practice consultant. Joe was frustrated with his lack of business and marketing skills when he left graduate school. He loved helping people through counseling, but felt that often people couldn’t find him. Over the past few years he has grown his skills, income, and ability to lead others, while still maintaining an active private practice in Traverse City, MI.